It is unusual, in our ‘sophisticated’ societies (Australia, New Zealand, North America and much of Western Europe) for anyone to tell their daughter, in her twenties, to celebrate death when it comes, to treat it as an exciting adventure. This sort of talk can seriously upset a young woman who considers herself completely removed from death – something that happens to old people or by accident, not something you plan for, let alone plan to celebrate. Louisa, the mother of the title, told her daughter that she looked forward to death as a great adventure. That adventure was to come many decades later. The authors are both medical doctors and therapists, running groups to help people develop life skills. Their three children also contribute to the book, which helps make it very personal. I felt that, as the reader, I had been invited into Joyce and Barry’s home, even to sit by the dying Louise’s bed. Such openness and honesty could have made the book heavy going. However, Joyce, in honouring her mother’s gift, brings to the reader Louise’s sense of adventure. I have read other personal accounts of dying and some have been all light and love. While A Mother’s Final Gift is suffused with love, the authors do not shy away from any of the pain – emotional and physical, theirs and Louise’s – that inevitably accompany dying for the departing person as well as for those who will be left behind. This honesty in the accounts of all five contributors, gives the book believability. It is this honesty, as much as Louise’s gift, that allows the reading of this book to be a transformative experience. There is more to this book, however, than an honest account of a family’s experience of accompanying someone in their dying. It shows that it is possible for someone to die in their own home, surrounded by the familiar and by family and friends. This may not be possible for everyone but, with good planning and good support, it would be available to so many more people who are now taken into the medical mill and lose most of their autonomy and, effectively, most of their rights. 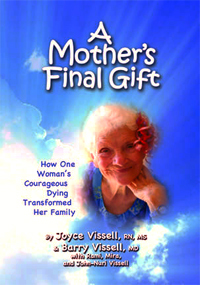 It was fortunate for Louisa and her family that Hospice services were available for her to die at home. Dying is not a medical condition and we do not deserve to have it treated as such. A Mother’s Final Gift is testament to this. For many people, their fear of death and of dying prevents them truly living. It was Louisa’s embracing of her death as part of life that allowed her to live her life to the full.